The family of city lawyer Assa Nyakundi, who shot and killed his son Joseph, is yet to come to terms with the tragedy. Not only is the incident painful to them but it has reopened wounds of a similar earlier experience. "We have no answers to the incident," a member of his family in Kisii County said Wednesday as police continue to investigate circumstances of the Sunday shooting. To his family, the shooting revives memories of the brutal murder of their father, Mr Michael Nyakundi, about a decade ago. They were yet to heal from the wounds when they were hit by the latest death of Joseph. "The Sunday incident has left us in shock. It is double tragedy with one of our own dead and another in hospital," Assa's younger brother, Bishop Eliud Nyakundi, who is a lecturer at Kisii University, told Nation. "Memories of our late father are still fresh in our minds and the latest incident only adds salt to injury," he said. In 2010, robbers broke into the home of the the retired clergyman and shot him dead. 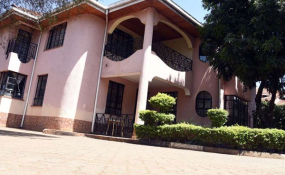 The armed gang stormed the home in Ikuruma village, Marani Sub-County in Kisii and forced the old man to lie on his bed before shooting him at close range as his wife watched. The Rev Michael Nyakundi, 85, had pleaded with the thugs to spare him but in vain. He gave them an unknown amount of money but they still murdered him. They did not steal any other item. The clergyman's killing prompted the beheading of four suspected gangsters in the same village by the dreaded Sungu Sungu vigilante group. "We are yet to come to terms with our father's murder. He had just returned from the US after undergoing an expensive spinal surgery that cost the family Sh5 million. Why would anyone want to kill an 85-year-old man?" Assa had said about his father's brutal murder then. On Wednesday, Assa's close relatives from Kisii travelled to Nairobi where they held a family meeting, deliberating on the next move for the man who has been recuperating at Nairobi Hospital under heavy police guard following the shocking shooting incident. In an in-depth interview with the Nation on Wednesday morning, Rev Eliud Nyakundi, who leads the Kenya Assemblies Churches in Gusii region, said the incident, as bad as it may be, is irreversible and they are now asking God to give them grace to endure. He further said his brother is not a criminal as some people are trying to insinuate, adding that the lawyer is even a church elder, brought up in a Christian background. Besides being an advocate, Assa is a deacon at International Christian Centre while his brother Eliud is an executive member of the National Council of Churches of Kenya (NCCK). Eliud said he cannot find a reason that could have made his brother to intentionally shoot and kill his son. "We are children of the clergy and we have been raised in a Christian environment. On the flipside, we are an educated family by any standards, not struggling financially and no career frustrations. We were raised beyond the village life and our father taught us to go out there and manage our world," said Eliud, the eighth born in their family. The 60-year-old Assa is the fourth born in a family of 12. Three of his brothers are in the USA. One of the brothers, Titus, is also an advocate and a chaplain at Mount Kenya University. "I am travelling to Nairobi so that we can discuss this issues in detail," said Eliud. Assa has been handling high profile criminal cases and the family feared he could be a soft target and urged him to get a gun. He is representing in court Nyeri Magistrate Pauline Omungala, who is accused of killing her husband, Robert Chesang. He is also in the defence team for three Chinese nationals who were in January arrested for illegal possession of wildlife trophies. According to the family, he has been a licenced firearm holder for the last 20 years, and all this time, he has neither threatened nor brandished his gun at anyone. A graduate of the University of Nairobi, Assa has been in private practice since 1985. "For all this time, he has handled his firearm well and at no single time did he misuse it. He is a person of stable mind and does not suffer anger or annoyance," said Eliud. The city lawyer has four children -- the eldest daughter is married in Ireland while the other one is in Denmark. The family further said that Joseph's elder brother, Noah, who is an advocate and a partner in his father's firm -- Nyakundi and Company Advocates -- may have acted out of emotion and confusion when he made a controversial post on Facebook about his brother's death. "That is the tragedy of social media. It was simply an emotional reaction and Noah has since sobered up and is regretting so much about it," said another relative. The family explains that there is no known dispute between Assa and his late son and that the fact that the 29-year-old Joseph was still living in his parents' house when he had options to move out tells of a good relationship in the family. Joseph's body is still at the Aga Khan Hospital mortuary awaiting post-mortem examination. He was taken there after he succumbed to the bullet injury from his father's pistol. Joseph had a degree in international relations from Daystar University and planned to go to Ireland where his sister lives. "He was there mid last year but he delayed joining university and had to come back home. He wanted to study a masters degree in international relations," said Eliud. Assa's wife, Lydia, is a high school teacher in Kiambu County.